So you've heard about this MVC thing and are still a little scared of it, maybe you want to try it out a little bit but you're not sure where to start? Just so you know, I'm not an ASP.NET MVC expert and am still learning more about how it works every day. But I know enough to be dangerous.. and do some pretty cool stuff with it, easily. I really HATE the WebForms/UserControl way of adding stuff in my "view" (the ascx file) to do validation and form field rendering. I think the way it's done in ASP.NET MVC is much cleaner, easier to use and easier to debug. Also, Model Binding is fantastic (although I hear that's possible in WebForms now as well). In this post I'll show you how to create a simple contact form that, optionally, allows people to write testimonials. The testimonials will be stored as nodes in Umbraco using the ContentService (new in Umbraco 6). I start out with a WebForms site and will move everything over to MVC after that. Bonus: the full site is available for download at the bottom of this post! A few months ago, I finally figured out why MVC shouldn't be scary for WebForms developers because in their basis, they are very similar. The only difference is that Visual Studio will generate the designer file for you and you can visually move items from your toolbox on your usercontrol's surface. This will then produce some HTML over which you have little control. With MVC you take back that control, which leads to a little more manual work but in my opinion that's completely worth it. If you're lazy like me though, you can always use the Scaffolding NuGet package to automate a lot of this work. Enough talking, show me the code! Okay, relax, it's coming. So let's start with the UserControl by producing this tagsoup thing (yech!). In the codebehind I manually fill the "Type of inquiry" dropdown with some values but this data could easily come from some data source like a database table. I have a mail helper class to help me send an e-mail and I need to give it some of the values from the form. Note that when the type of inquiry is a testimonial, I create a new node under the Testimonials node in Umbraco. Also notice that I'm not using the old Document API so only a few lines of code is needed to create a new document, set the values and then you can just say: SaveAndPublish, awesome! 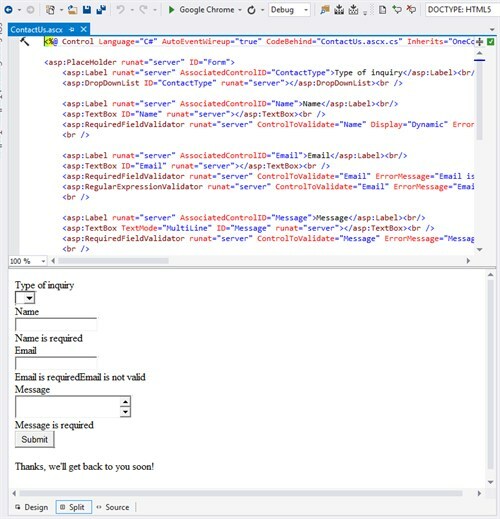 So I wrapped this UserControl in a macro and add that macro to the Contact.master template. Wonderful, I have a working form now that optionally creates testimonials if I select that from the "type" dropdown. Just what I wanted... Almost. I really wanted to explore MVC and make a clean implementation. In order to do that, I decided to convert all my templates to MVC Views. Which really is surprisingly easy. Okay, with that out of the way, create a new file in the Views folder called umbMaster.cshtml. This is the exact same filename as the masterpage had. Into umbMaster.cshtml I copy everything that is already in umbMaster.master. Then I can make a few simple changes to turn it into a full MVC view. For this, it's easiest to use the Masterpages2Views cheatsheet and just find everything that says runat="server" and replace it with the MVC View equivalent. Even fewer changes are needed for the umbTextPage template. Again, I'll do the same thing: make a umbTextPage.cshtml file, copy the contents of umbTextPage.master into it and make a few changes to turn it into a View. Nice, the validations that I previously had to put in the tagsoup on the ascx file are now added as simple attributes on the fields here. This will return the contact page with everything in the form still filled in, if client side validation failed and we notice an error on the server side, I want return to the filled in form to show the errors and make it easy for the user to correct them. This does a full redirect to the contact page, meaning that when you then hit refresh in your browser you won't get asked if you want to post the form again, instead it just loads the empty form again. Now for the final pieces of the puzzle: the View. All of my views, including the Contact.cshtml have to inherit from UmbracoTemplatePage so that the relevant Umbraco bits are added into it. Inheriting from this class allows me to use things like Umbraco.Field and Umbraco.RenderMacro. The model for these views is the "current page". However, to be able to render the form and our validation, I need a view that uses my previously made ContactModel as a model, not the current page. 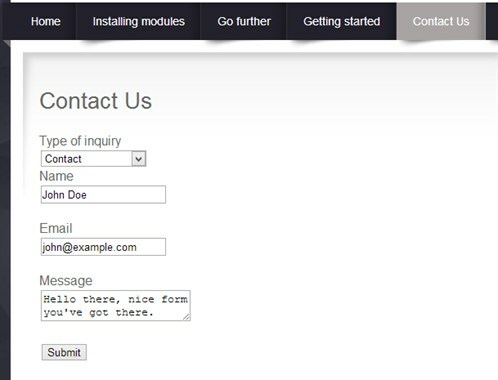 In the ContactController I created earlier, I added some TempData when the form had been successfully posted. I use that here to either show the form or the success message. If you're used to "regular" MVC, you'll notice that I'm not using Html.BeginForm but Html.BeginUmbracoForm. This is so that Umbraco knows how to do the routing correctly. The HTML produced by Html.EditorFor is already very clean and simple, we could also just say something like <input type="text" id="Name" /> and that would work perfectly fine as well and allows me to have full control over the HTML. Once you wrap your head around it, you'll realize that making templates and forms the MVC way is not so hard and you can move on to more advanced scenario's, taking advantage of AJAX forms for example, and Umbraco Partial View Macro's to pass in parameters, or MVC's powerful EditorTemplates and DisplayTemplates. The world is your oyster!